Funny Farm: Thanksgiving is over, so back to work! The Union is beamed for 3 rugs. Two will be denim runners. I cut the denim strips 1" wide and will lay two strips in each shed. That's the plan today. I'm undecided what to use as weft for the third rug. I have Pendelton "worms" in this colorway so that is a possibility. I also have some acrylic chenille that could be doubled or tripled. I could use the chenille and the worms. I still need to thread the heddles and sley the reed. Hey, a girl can only do so much in a day. Another double weave blanket. This is ready to be woven. Since the last photo from last week, it remained untouched until today. I wound it on and it's tied onto the front. It's a "go". Thanksgiving was wonderful. Three of the four Evil Spawns came, along with my son-in-law and two grandsons. The boys helped Bob burn many brush fires and chop down saplings. Nothing like child labor. Gorgeous, but then I'm a sucker for a new warp picture! I like the color layout for the doubleweave blanket. Are the wider blue stripes going to be on the outside? Yes, Charleen. The wider blue stripes will be on the outside edges. 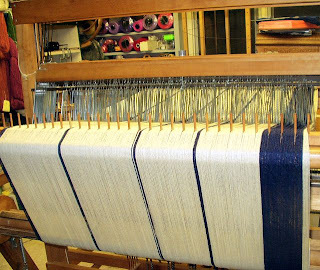 I like new warps too...then I must weave it off! So nice to see such industry! And aren't we lucky to call this *work*? 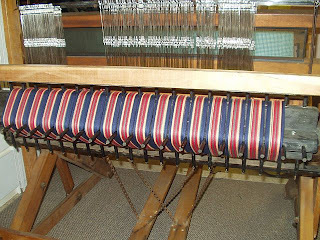 OH man, I've just read Leigh's and Sara's blogs showing weaving industry and I have to *go* to work tomorrow. Sara's right - you're lucky. The top loom only two treadles which looks kinda odd but I haven't seen that many looms. Is it a compu-dobby? ?